OK I am back on the job full time again! Spoke to Rory again this evening, but had a very bad connection, but did manage to grab a few lines off him. 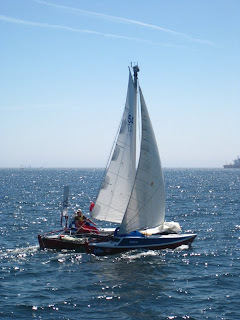 Yesterday he went through another big gale/storm, and rather than just hammer on into it, he decided to lay a-hull, so only sailed about 45 miles. He has had some concerns with the back beam and movement. The mainsheet traveler is attached to the back beam, and so therefore takes the full weight of the main, when under sail. In order to take some of this pressure off the beam, Rory has tied some lashings from the back beam, to the middle beam, thus so far, keeping the back beam much more stable. Harry (wind-vane) has also had some adjustments made to him..... Rory took the drill to him! Every main component on Harry now has a lifeline attached:) Rory was worried about losing Harry, or parts of Harry, during the storms theyhave been encountering, and wanted to ensure that Harry remained on board at all times! Weather much nicer this morning, Force 3-4 all day, sailing along at about 6 knots, heading west under full sail. Spray but......no big waves!! Hurray. Big relief, cos Rory also mentioned he came very close to a big ship last night in the midst of the storm. And of course......his VHF radio wasn't charged so he couldn't hail them and let them know he was about. He said it was probably half a mile away.......but when the ship involved is half a mile LONG.......that is a little too close. He saw his first sharkof the trip today......only about 4ft long, but spotted just as he had hung the charger over the back stern!! Also lots of Portuguese Man O War. Interesting about the beam movement, would love to know the cause.. lashings stretched maybe? Anyway sounds like Rory has it under control. Keep up the good work!